The annual awards for 2009 were conferred on St. Constantine & Helen’s Day, May 24th 2009 at our clubrooms. For information on this year’s awardees please visit the AWARDS section. Profiles and pictures available and an overview of how the day unfolded will be coming shortly. In addition to the Kazzie of the Year, Kastellorizian Youth Achievement and VCE Awards we have, for the first time, formerly bestowed Honorary Life Memberships for long-standing committment to the Association. John Basil Salvaris was born on 23/05/30, in Port Said, Egypt to Kastellorizians, Vasilios and Evangelia (Miriklis) Salvaris. John spent his childhood and youth with his parents and younger brother, Andrew in Port Said. John attended the Greek Orthodox College of Port Said where he became fluent in Greek, English, French and Arabic. During this time John was also an active member of the Scouts. He completed his Baccalaureate in Egypt in 1948. This qualification gave him a place to study at the University of Athens, Greece and the University of Alexandria, Egypt. However the political climate in Egypt and Greece was unsettled and the family decided to follow the migratory path of Vasilios’s brothers and sister to and immigrate to Australia. John was the first of his immediate family to arrive in Australia and a few years later was joined a by his parents and brother, Andrew. The family was active in the Greek community in Melbourne and would often visit the Kastellorizian Club in Lonsdale St.
John’s school certificates from Egypt were not accepted in Australia and he enrolled in the equivalent of year 12 at George Taylor’s and Staff College where he competed his Matriculation. John then studied Applied Chemistry at RMIT. John’s first job was at the Commonwealth Serum Laboratories (CSL) where he work as a Research Scientist on polio myelitis. Later in John’s Scientific career, he became Technical Superintendent and Director of Research at Boral Kinnears. John’s project at Kinnears included the investigation of materials and processes related to the design and manufacture of company products such as ropes and threads, synthetic fibres, carpets, artificial lawn and artificial ligaments for use in human surgery. During his career, he under took Post Graduate Diploma in Management at RMIT and was active member of the Royal Australasian Chemical Institute and Chair Person of Western District Productivity Group and a committee member of the Australian Standards Committee for the revision of Australian Standards for yarns and fibre ropes. John married Stella Christopher, the second daughter Christos and Paraskevi (Theodore) Christopher. They have three children; Evelyn, Basil and Priscilla and two grandchildren, John and Christina. Their son, Basil lives in Sydney and is married to Josephine Lo Ricco. Priscilla and her Partner, Steve Newlands live in Melbourne. However between John’s career and family, he also dedicated time to the Greek, Kastellorizian and Australian communities. 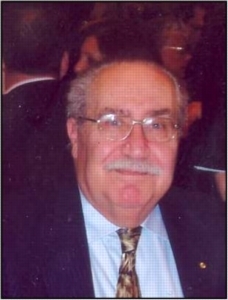 In the 1970’s John was an active member of the Hawthorn Lions Club and was a member of the Greek Professional Association and he later became their Vice President. 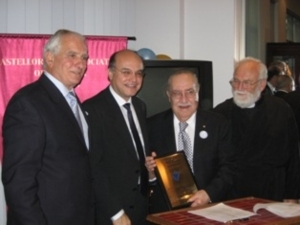 Experiencing the passing of his parents and his participation in both Greek and Australian organizations, he became aware of the urgent need for facilities for the care of Greek speaking Elderly. He prepared and submitted to the Australian Government a report and plan of action, outlining and emphasizing the urgency for Ethno specific facilities for the care of migrant elderly and the need for financial assistance. He then established and registered an organization (The Greek Australian Society for the Care of the Elderly (GASCE) under the Patronage of the Governor of Victoria. • applied for further government funding to extend the Hostel into a Nursing Home. In 1988 John received an OAM for services to the Elderly and Greek Community. Despite his busy schedule, John also found time to actively participate in the Kastellorizian Association of Victoria and he continues to do so today. John served as Committee member in the late 1980’s and early 1990’s. During this time he also took on the role of Treasurer. It is ironic that during his time on the Kastellorizian committee, John was one of the key initiators of the Kastellorizian of the Year Award. Following resignation from the main committee, John has continued to support of the Association through his involvement on numerous subcommittees including the Sub-committee for the review of the Rules of the Association (20007-8). He has given many historical lectures about Kastellorizo. John is passionate about Kastellorizo and visited the island with his wife, Stella in 1996. He is an advocator of the preservation of historical and cultural knowledge about Kastellorizo. He is regular contributor to the Historical section of the Kazzie News, the official newsletter of the Kastellorizian Association of Victoria. He is also interested in the Kastellorizian diaspora in Australia. He is keen to record and preserve how the Kastellorizians and their descendants have contributed to Australian history and society. John’s love of history does not end with Kastellorizian history. His other historical passion is Byzantine history. He combines this interest with his on going involvement in the Australian community as he is currently a voluntary Lecturer in Byzantine History for the University of the 3 Age (U3A) at the Swinburne campus in Hawthorn. John has held the lectureship at U3a position since his retirement. John is also a Member of the Australian Association for Byzantine Studies and has written and presented papers to them on Byzantium. John enjoys spending time with his family and visiting his grandchildren in Sydney. John’s love of history does not end with Kastellorizian history. His other historical passion is Byzantine history. He combines this interest with his on-going involvement in the Australian community as he is currently a voluntary Lecturer in Byzantine History for the University of the 3 Age (U3A) at the Swinburne campus in Hawthorn. John has held the lectureship at U3a position since his retirement.